As part of their effort to kick-start the eventual colonization of Mars, SpaceX is sending an unmanned Dragon spacecraft to Mars. Initially, that mission was set for 2018, but is now re-scheduled for 2020. Now, SpaceX says they’re working with NASA to select a suitable landing site for their first Dragon mission to Mars. But finding a site that meets those conditions is difficult. According to SpaceNews, the study done with NASA initially recognized 4 regions in Mars’ northern hemisphere, all within 40 degrees of the equator. They are Deuteronilus Mensae, Phlegra Montes, Utopia Planitia, and Arcadia Planitia. Deuteronilus Mensae (DM) is located between older, cratered highlands and low plains. DM shows evidence of glacial activity in its surface features. In fact, there are still glaciers there, which makes it a desirable source of ice. Phlegra Montes (PM) is a system of mountains on the Martian surface, over 1300 km across. It’s a complex system of basins, hills, and ridges. They are likely tectonic in origin, rather than volcanic, and the region probably contains large quantities of water ice, perhaps 20 meters below the surface. Utopia Planitia (UP) is the region where the Viking 2 lander set down in 1976. At 3300 km in diameter, UP is the largest impact basin in the Solar System. In 2016, NASA found a huge deposit of underground ice there. The water is estimated to be the same volume as Lake Superior. Arcadia Planitia (AP) is a smooth plain containing fresh lava flows. It also has a large region that was shaped by periglacial processes. This supports the idea that ice is present just beneath the surface, making it a candidate for colonization efforts. The image below shows the Arcadia Planitia region in relation to some of its surroundings. Colonists at AP might have a great view of Olympus Mons, the largest volcano in the Solar System. Colonists in Arcadia Planitia (upper left in map) might have a great view of Olympus Mons. The fourth area, Arcadia Planitia, is a more promising site. HiRISE images showed that it is much less rocky and could be a suitable site for the first Dragon mission to Mars. The Dragon mission to Mars is just the first step for SpaceX. They see themselves as an interplanetary transportation company eventually. SpaceX intends to send a craft to Mars every two years, when the launch window is optimal. SpaceX says they’ll have the ability to deliver one ton of payload to the Martian surface with each Dragon mission. Their Interplanetary Transport System (ITS) might have the capability to make it to Mars in as little as 80 days, while carrying a payload of up to 450 tons. While still in the very initial stages of design, it may eventually revolutionize our ability to colonize Mars in any meaningful or enduring way. SpaceX envisions a fleet of craft in the ITS which will constantly make the return to trip to Mars. If that ever happens, we may look at the first Dragon mission to Arcadia Planitia, or another eventual landing site, as the first step. SpaceX CEO Elon Musk shared this amazing drone footage of the Falcon 9 rocket’s first stage returning for a perfect landing after the launch of the Dragon capsule to the International Space Station. It drops flawlessly through the clouds, easy as pie, touching down at SpaceX’s Landing Zone 1 at Cape Canaveral. As cool as the first stage landing was, the launch had a notable starting place. As our Ken Kremer reported yesterday, “the era of undesired idleness for America’s most famous launch pad was broken at last by the rumbling thunder of a SpaceX Falcon 9.” The SpaceX launch took place on the historic Launchpad 39-A, the same spot where Apollo astronauts began their journey to the Moon and space shuttles set off on their missions. 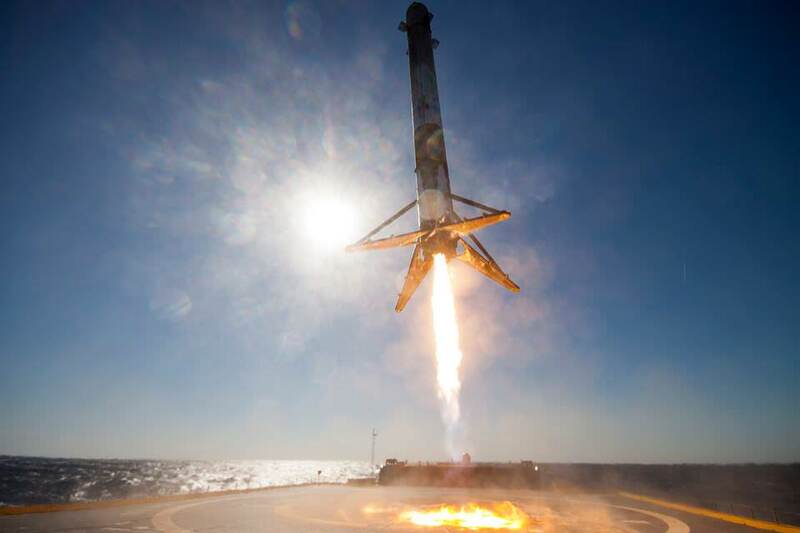 SpaceX’s CRS-10 resupply mission to the International Space Station was the second successful launch for the commercial space company since the launch pad explosion in September 2016. Dragon will rendezvous and be docked to the ISS, on Wednesday, March 22, bringing about 5,500 pounds of supplies and experiments.